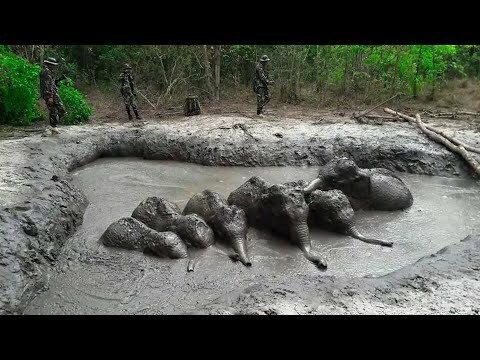 BANGKOK (AP) — Six baby elephants, trapped in a mud hole and separated from their parents, have been rescued by a team of park rangers in northeastern Thailand. The rangers came across the elephant calves on Wednesday afternoon as they were struggling to climb the pit’s slippery banks, according to officials of Thap Lan National Park. “Gone, they’re gone,” cries a ranger, as the rescue crew comes together to celebrate. Elephants are the official national animal of Thailand, and for a time graced the country’s flag when it was still called Siam. But they do have their dark side. Development has sharply reduced their natural habitat and shrunk their numbers. They are notorious for raiding farmers’ fields for food, especially sugar cane.